Can't say I have high hopes for this movie because the first two seemed to be right on track and ended up being just okay. The first films have a very low rewatchability factor as well, something I'm known for. Hopefully I'm wrong, but just like the first two films the trailer looks awesome, just not sure the finished product will be the same. 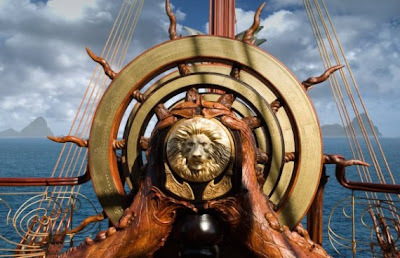 "The Chronicles of Narnia: The Voyage of the Dawn Treader" is set for a December 10th release. Official synopsis: Edmund and Lucy Pevensie, along with their pesky cousin Eustace Scrubb – find themselves swallowed into a painting and on to a fantastic Narnian ship headed for the very edges of the world. Joining forces once again with their royal friend Prince Caspian and the warrior mouse Reepicheep, they are whisked away on a mysterious mission to the Lone Islands, and beyond. On this bewitching voyage that will test their hearts and spirits, the trio will face magical Dufflepuds, sinister slave traders, roaring dragons and enchanted merfolk. Only an entirely uncharted journey to Aslan’s Country – a voyage of destiny and transformation for each of those aboard the Dawn Treader – can save Narnia, and all the astonishing creatures in it, from an unfathomable fate.